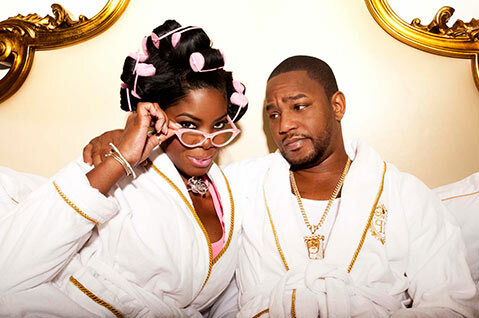 <b>DRESS TO IMPRESS:</b> Rapper Cam'ron (pictured right with gal pal JuJu) will kick off Halloween weekend on Thursday, October 30, at Velvet Jones. Oh, Halloween. Bizarre, divisive, sloppy Halloween. As a UCSB alum, my connection with this weekend’s festivities is an especially peculiar one. Truthfully, my mostly-love, sometimes-hate relationship with Halloween goes waaaayy back. With a birthday that falls the day before (that’s today, ghosts and ghouls! ), Halloween always had the added benefit of providing me with ridiculously elaborate, high-stakes dress-up parties — not to mention enough sugar to rot the teeth off five small kids. Growing up, Halloween was my holiday. And you’d better bet I dressed like every Disney princess in the book when it came time to celebrate. Come college, that tradition continued. Except instead of cakes made out of gummy worms and floor-length gowns, I was taking orange Jell-O shots and championing the “shorter the better” costuming rule. In those four years, Halloween crossed over from child’s play to the one night a year when grown people let their freak flags fly — and still, for whatever reason, I remained dutifully attached. Nowadays, many years removed from chaotic drunken stumbles down Del Playa Drive, I realize that College Halloween and Adult Halloween are not all that different. The day still goes hand-in-hand with copious sugary consumption. And women are still running around in getups that barely constitute clothes. Most importantly, though, Halloween still marks that one day of the year when folks joyously step outside of the norm, embrace their inner weirdo, and don’t have to worry about getting strange judgmental looks for it. As such, Adult Halloween has brought with it some of my all-time-favorite music-going experiences. Because what goes better with crazy outfits and pure abandon than good, floor-thumping live tunes? If you’re headed out of the house this weekend, the options are practically endless as far as events and parties are concerned. But if you’re hoping for your tricks and treats to be served with a side of amplification, I’ve got you covered. On Friday night, FUNZONE (226 S. Milpas St., located in the East Beach Batting Cages) hosts a six-band lineup featuring some of my favorite budding S.B. talents, as well as Baltimore passers-through Outer Spaces, who craft adorably lo-fi, shoegaze-y folk rock that calls to mind my all-time personal faves, Rilo Kiley. The show starts at 6 p.m. and also features Santa Barbara’s own Cave Babies, Internet, Maru, Nap, and Venturans Soul Hex. The show is all-ages. Drugs and alcohol are prohibited, but arts, crafts, and free batting cage time is included in the $5 (!!) ticket price. Visit facebook.com/funzonesantabarbara. The party starts at 9:30 p.m. Come dressed to impress — and ready to dance. On an northbound and heartwarming note, this Halloween is also seeing UCSB try something new — namely, a big blowout concert event to help keep students off the wild and crazy streets of I.V. On Friday, O.C. rockers Young the Giant take the stage at UCSB’s Thunderdome for a students-only concert presented by Associated Students Program Board. Anyone with an student ID I can borrow, please inquire here. Also Friday, Playback Recording Studios (400 E. Gutierrez St.) hosts a Halloween bash that features live sets from some of its most loyal customers, including Indy favorites Pacific Haze and Grooveshine. Tickets are $40 and include beer, wine, and a costume contest with prizes. For info and tickets, call 730-7529. And if you’re in the mood for a little pre-game action, this Thursday, October 30, Velvet Jones is playing host to Harlem hip-hop giant Cam’ron. Killa Cam may best be known for his feuds nowadays, but I’m not holding it against him. (Anyone willing to stand up to Kanye is okay in my book, am I right?) Plus, how often do you get the chance to throw on a costume and dance to “Oh Boy” live? Yeah, that’s what I thought. The 18+ show starts at 9 p.m. with openers Chalk B Music, Yung Deem, Elliot Niezel, and DJ Hecktik. Visit camronsb.nightout.com for tickets and info.